What better way to kick off Advertising Week that with the ultimate brand fail? Yes, it's Adobe and Goodby, Silverstein & Partners's latest "Do you know what your marketing is doing?" campaign. Client and agency have partnered on several of these spots, and the new installment is as entertaining as the previous ones, "Click, Baby, Click!" and "Woo Woo?" The message here, clearly communicated if not in these words, is that advertising doesn't have to be rocket science, even as marketing gets more sophisticated and data heavy. The new spot comically shows that marketing decisions made without data or through siloed teams can be disastrous. "In the two years since we launched the campaign, marketing has become increasingly complicated with an explosion of new channels and fresh sources of data," Adobe vp of experience marketing Alex Amado tells Adweek. "However, the bottom line remains the same: Adobe is the company helping marketers make sense of and act on their data, so they can really know what their marketing is doing." The space theme is amusingly overblown, which is the point, but still relatable, says Amado. "Launching a mission to Mars seemed like one of the largest, most audacious projects we could think of, and we thought it would be funny to show it being derailed by conflicting and disconnected sources of data," he says. 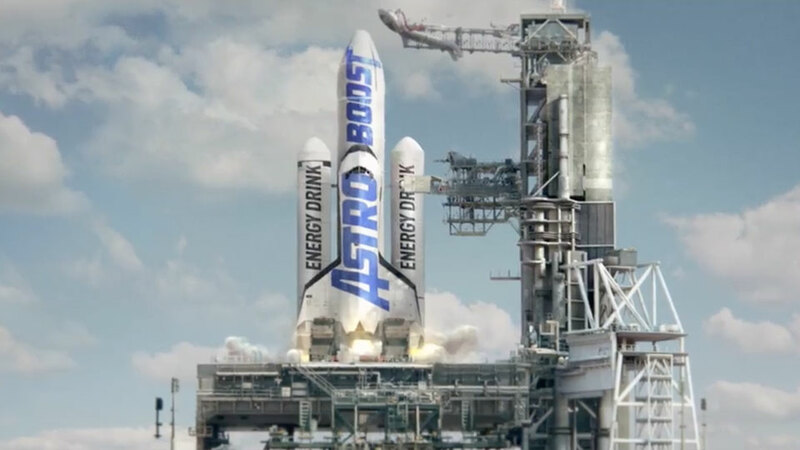 "We think the campaign will resonate with marketers because while they've probably never had to scrub a space launch, many of them have had campaigns 'fail to launch' due to last-minute changes, conflicting data sources or lack of insight." Will Elliott, creative director at GS&P, said the situation is "all too familiar as it relates to modern-day marketing—the moment you're ready to launch a campaign and suddenly there are a million voices telling you to stop or move in a different direction. And we wanted to show that if you're feeling overwhelmed by data, Adobe can help you make informed marketing decisions from the start." In addition to paid placements, the spot will be shown at many Advertising Week sessions, as previous ads in the campaign were. But this year, Adobe is taking the campaign a step further by bring AstroBoost to life as "the official beverage of marketers" during the event. The drink will be distributed by teams on the ground, and there will be "taste tests" and other activities. @Adweek taste is not a failure. Who are you to judge? Come to Times Center and delight in an Astroboost. Interplanetary. The Advertising Week integrations are key for the campaign, says Amado. "Advertising Week provides the ideal audience for this campaign—modern marketers who are actively seeking insights and information to improve their work," he says. "It's also our third year debuting a new ad at Advertising Week, and we almost see this as a kind of 'PSA' about the pitfalls of modern marketing. Whether it's not fully understanding your data with 'Click, Baby, Click!,' trying to predict the next social media fad with 'Woo Woo?' or being overwhelmed by too many uncoordinated data sources and failing at the broader mission with 'The Launch,' these are extreme versions of very real problems, and they drive great conversations at Advertising Week and beyond."